As a result of my recent, intense encounter with the films of Roberto Rossellini, I’m thinking a lot lately about the possibilities entailed in breaking style conventions not simply for innovation’s sake but in the name of moving past the limits of style itself. Such formal attempts to get at something more substantial than “mere” form, seem to be, perhaps inevitably so, inseparable from spirituality itself. In other words, I seem to have found the right moment to start exploring the films of Robert Bresson. My first and only previous Bresson viewing experience was a small-screen (CRT I think) viewing of Au Hasard Balthazar some seven or eight years ago. It was an emotional bombshell of a film but I don’t remember doing much thinking about how it achieved its effect, other than the obvious scrupulous/rigorous follow-through entailed in taking an animal’s point of view through an entire feature film narrative arc. I probably couldn’t have told you anything very specific about how Bresson accomplished what he did. Having now watched through the various special features on the Criterion release of A Man Escaped (detailed in this review) I feel I have a much better grasp of Bresson’s methodology and vision. So let me here put in a plug for The Essence of Forms, a 2010 doc (46 min.) 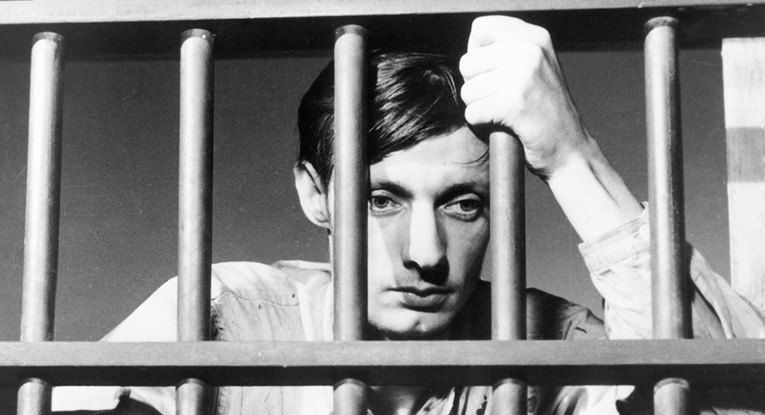 that appeared originally on the Gaumont French Blu-ray release of the film and offers a series of insights into Bresson’s filmmaking approach, from collaborators and critics. Unlike the other docs about him included here, it includes only clips from A Man Escaped even though it considers his whole career—so it is both fascinating and free of spoilers for his other films. With the other, older docs included I found myself fast-forwarding through some clips from other films that I haven’t yet seen. So if you are going to pick just one of the special features to watch after a first viewing of this film I recommend this one. Criterion issued their meticulously-restored edition of A Man Escaped back in March, so I am about 9 months late to this party—the first Bresson film to be released in high-def video. Region B releases of Au hazard Balthazar and Mouchette from Artificial Eye were originally due early this year but have been repeatedly delayed and are now due to drop in March 2014. Can’t wait.